The whereabouts of hundreds of Britons in the Middle East fighting for jihadist groups is unknown, the security minister has admitted. He told BBC Radio 4’s Today programme: ‘What we do know is about half have come back to the United Kingdom of the original 850-odd that went out of concern. 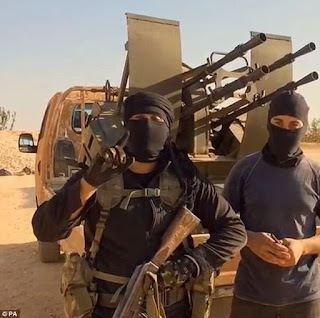 A fierce debate has raged about how to deal with the estimated 360 battle-hardened jihadis who have returned to Britain after fighting with Islamic State in Syria and Iraq and the ones who may come back now after the fall of the so-called caliphate. Terror law watchdog Max Hill QC caused a storm earlier this month when he said ‘naïve’ teenagers should be allowed to reintegrate into society, while Foreign Office Minister Rory Stewart said most followers of IS’s ‘hateful doctrine’ posed a ‘serious danger’ to the UK and should be killed.